6.P.3A.1 Analyze and interpret data to describe the properties and compare sources of different forms of energy (including mechanical, electrical, chemical, radiant, and thermal). ● Thermal energy is the energy that is associated with the motion of the particles in a substance. ● All matter is made up of atoms (particles) that move faster when they heat up. The faster the particles move, the higher the temperature. ● Heat energy is the transfer of thermal energy. ● Heat energy always moves from hotter objects to cooler objects. ● Energy which is transferred through electromagnetic waves such as visible light, ultraviolet light or X- rays. ● Solar energy is a type of radiant energy. ○ Green plants use solar energy during photosynthesis. ○ Most of the energy that we use on Earth originally came from the Sun. ● Sources of radiant energy include, but are not limited to, stars, light bulbs, and microwaves. ● Chemical energy is energy stored within the chemical bonds in matter. ● Chemical energy can be released, for example in batteries or sugar/food, when these substances react to form new substances. ● Electrical energy is the energy flowing in an electric circuit. ● Sources of electrical energy include: stored chemical energy in batteries; solar energy in solar cells; fuels or hydroelectric energy in generators. ● Mechanical energy is the energy due to the motion (kinetic) and position (potential) of an object. When objects are set in motion or are in a position where they can be set in motion, they have mechanical energy. ○ Mechanical Potential energy: Potential energy is stored energy. Mechanical potential energy is related to the position of an object. A stretched rubber band has potential energy. This is called elastic potential energy. A book on a shelf has potential energy. Since gravity can pull the book to the floor, this is called gravitational potential energy. The height and mass of an object affect gravitation potential energy. ● Gravitational potential energy is greater when the height of an object is greater because more kinetic energy was required to raise the object to the greater height. Gravitational potential energy is greater when the mass of the object is greater because more kinetic energy is required to lift the heavier object. ● Examples of this can include, but are not limited to, lifting a book to a height of 2 meters instead of 1 meter; and lifting a basketball to a height of one meter and then lifting a bowling ball to a height of 1 meter. Kinetic energy is the energy an object has due to its motion. Mechanical kinetic energy increases as an object moves faster. 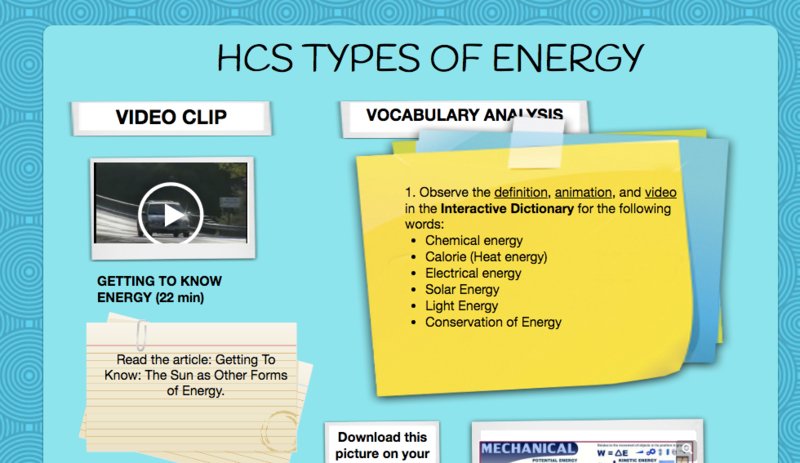 Sign into discovery ed and type "HCS Types of Energy" in the search bar. Click on Advanced Search and select "Boards" under media type. Click on the pics on the right for quick access. Play Video with Video Quiz Embedded. You will need to enter your first and last name to take it.